Date: Saturday, May 30, 2015, 8 a.m. to 1 p.m.
In-Person and LIVE Webcast registration options available. Registration includes a PDF copy of event materials. 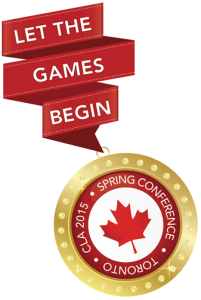 CPD CONFIRMED - The Criminal Lawyers’ Association 2015 Annual Spring Conference – Let the Games Begin program being held on May 30, 2015 has been accredited for 0 hr 45 min Professionalism Content. This program is also eligible for up to 3 hr 15 min Substantive Content. All registrants will receive a PDF copy of the conference materials within 24 hours of the event to the email provided when registering. Printed materials are not available for order and will not be provided. In-person and LIVE webcast options available. Registrants will be asked to select option when registering. Webcast registrants will be sent log-in information for the webcast within 24 hours of the session and to the e-mail provided when registering. To download a registration form that can be mailed, emailed or faxed to the CLA office, please click here.